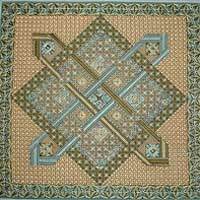 An interesting design in crewel wools and hand-dyed silk. 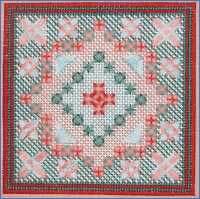 Small exciting design in crewel wools, stranded and pearl cottons. 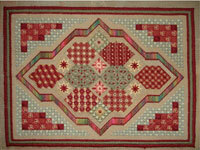 Oblong panel worked in crewel wool, stranded cotton and overdyed cotton. 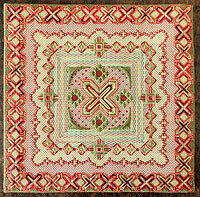 An interesting symmetrical design using a number of attractive stitches. 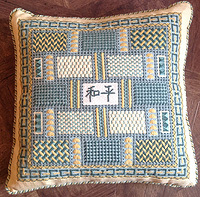 Only one colourway can be ordered at present but another 2 will be available soon. 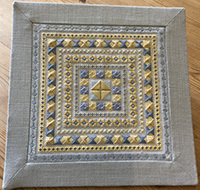 Small cushion, in crewel wool, making a perfect present. 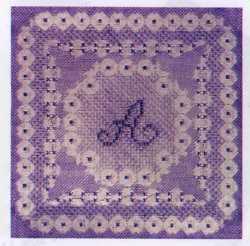 Any initial from the full alphabet provided can be worked. 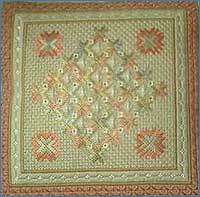 An interesting design in Crewel Wool and Pearl Cotton, with several different stitches. 14 and 18 mesh canvas. 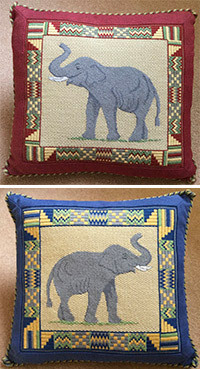 Price £65.00 each or £100 for a pair	(£30 discount) if ordered together. 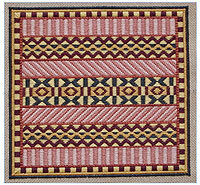 Available in Red or Blue or the pair. 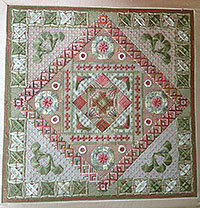 Florentine Design worked in crewel wools. 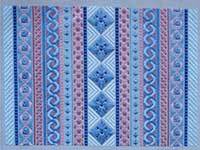 Suitable for less experienced stitchers. 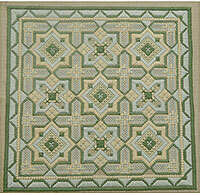 Design in crewel wools using a combination of Florentine and textured stitches. 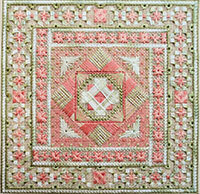 A very decorative canvas, using stranded cottons, pearl cotton and silk on 18 mesh mono canvas. 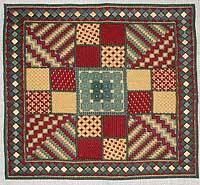 There are many coloured threads in this design. 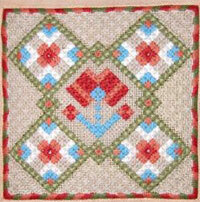 Panel inspired by a 17th century sampler, in seven shades of crewel wool. 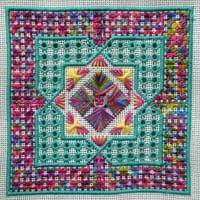 A design using mixed threads. 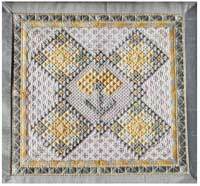 A design worked in stranded, pearl cotton, pearlised and metallic threads, with a metallic thread running through. 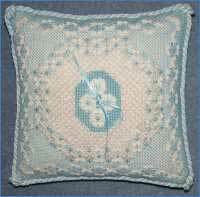 Suitable for a Ring Pillow Christening Gift etc. 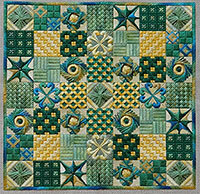 Attractive star motif worked in variegated threads on a lacey background. 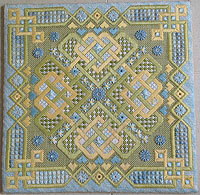 Border worked in crewel wools, pearl and stranded cottons. 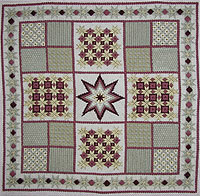 Attractive star motif worked in crewel wool, stranded and pearl cotton, and overdyed floss. 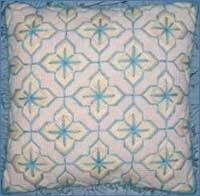 Interesting and delicate design, worked on 18 mesh, using stranded cottons and overdyed pearl cottons. 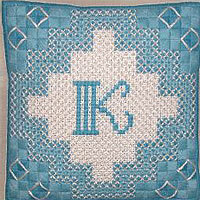 For the more experienced stitcher. 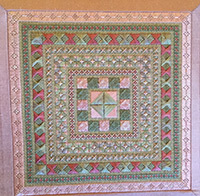 Frame size 10in x 10in. 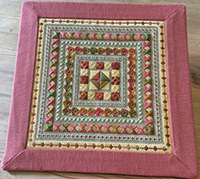 Finished size approximately 18 cm x 17.5 cm approx 6 7/8 in x 7 1/8 in. 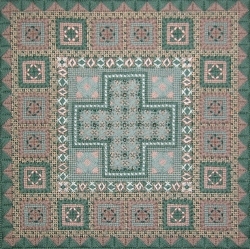 A decorative canvas inspired by tiles in Christchurch Cathedral on New Zealand’s South Island. 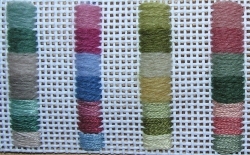 Crewel wool, stranded cotton and over-dyed silk. 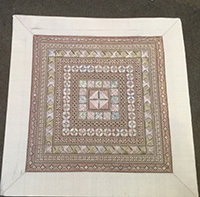 Frame size 16in x 41cm square. 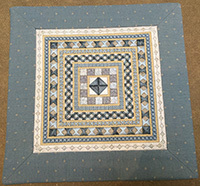 Finished size approximately 13in, 33cm square. 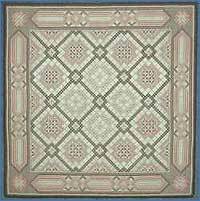 Generous sized design worked crewel wools. 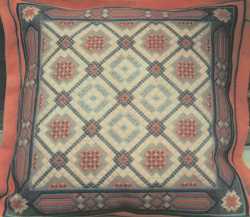 Illustration shows a custom Scheme. 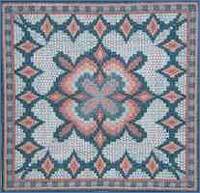 Generous-sized design worked in crewel wools, pearl and stranded cottons. 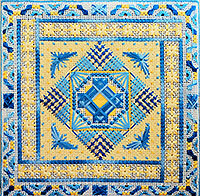 Advanced Florentine design with eight distinctive motifs and wide border, worked in crewel wool. 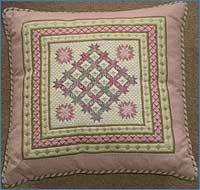 An initial pillow with a garland design worked in crewel wool, pearl and stranded cotton, and hand-dyed silk. 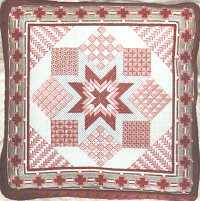 A pair could be prepared in the chosen scheme as wedding kneelers. 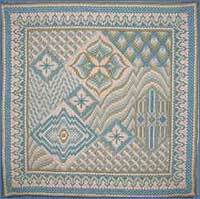 An intricate design with a wide range of stitches in crewel wool and stranded cotton.